The Jeju Special Self-Governing Province celebrated its second year as a Smart Grid test bed by establishing stronger relationships with other similar projects throughout the world from Nov. 1 to 2. Experts from Korea, Japan, China, and Denmark came for the two-day event to visit the island’s Smart Grid facilities and to give lectures about their own projects. The purpose of the event was “to build stronger bonds of sympathy on the Smart Grid industry among Jeju residents and attract more attention to the field. 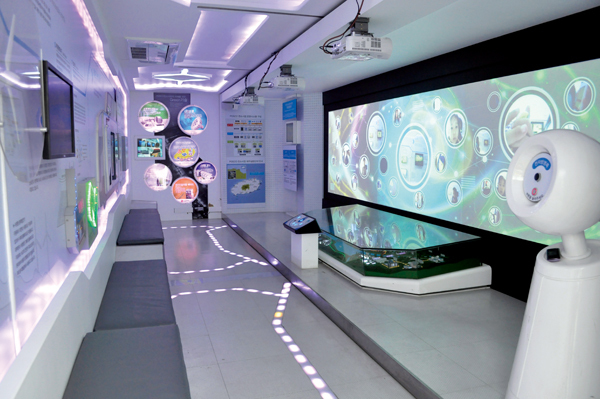 The second commemoration is meaningful [because] we established a stronger bond with leading Smart Grid testing cities in Korea, China, and Japan,” said Jeju Technopark Digital Convergence Center Director Jang Won-Guk. The event was comprised of three parts: the commemoration ceremony, at the Smart Grid test bed site in Gujwa-eup, Jeju City; conferences by international Smart Grid experts at the Venture Maru building in Jeju City Hall on Nov. 1, and a tour of the smart grid facilities on Nov. 2. Approximately 700 people attended the commemoration ceremony and 300 people attended the lectures. During his welcoming address, Jeju Vice Governor Kim Bo Il said, “I promise you that Jeju will join the world map in terms of Smart Grid,” a prominent theme during the event which was frequently reinforced by guests. After his lecture, Dr. Takahir Suzuki, director general of Nagasaki EV&ITS Promotion for the Nagasaki Prefecture Government agreed with the vice governor’s assessment, saying Jeju is one of the great leaders of the Smart Gird. Suzuki said he was most impressed with the Smart Grid Information Center. He continued that the information center is integral “to expand[ing] the Smart Grid system,” which Jeju plans to by converting the entire island into a Smart Grid. The information center “is important to distribute [and] to disseminate information to the local people … That information center takes a great role,” Suzukit said. She said that it is important for islands like Jeju and Bornholm to be Smart Grid test beds because “technology tends to come later” to islands and, “If we can become a test bed we can get technology early,” which provides economic growth possibilities while affording island residents with technologies that they general would not have access to. Smart Grid industries have garnered much media attention lately, one of the reasons why this event was important. “The entire world’s attention is focused on Smart Grid as a representative industry in green growth. 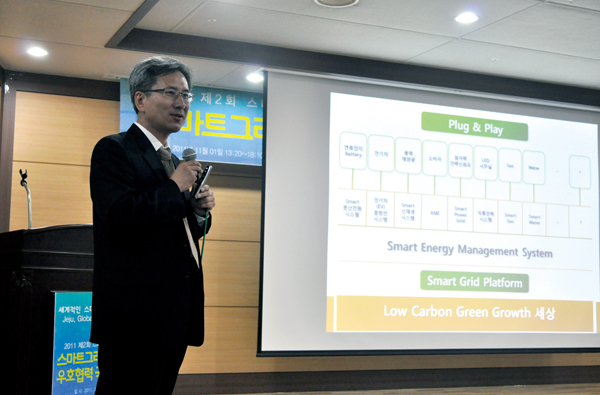 Smart Grid Day was established Nov. 1, 2010 to promote Jeju as [a] Smart Grid frontier city in Korea, and this year’s event helped to proclaim Jeju as [a] leading area,” said Jang in an email interview with The Weekly. During the event an agreement was signed between KEPCO [Korea Electric Power Corporation] and the Jeju Special Self-Governing Province to work together to make Gapado Island completely carbon free by using a new form of energy production. According to the agreement, KEPCO will be in charge of supplying island residents with smart meters, establishing the system and overseeing its management, while Jeju will manage the overall project and build the electrical vehicle charging station infrastructure. Also, “KEPCO will develop a 100 percent self-energy-generating system to optimize energy supply to rural areas … In the future [KEPCO] will export this technique to remote areas in less developed countries,” read a press release.